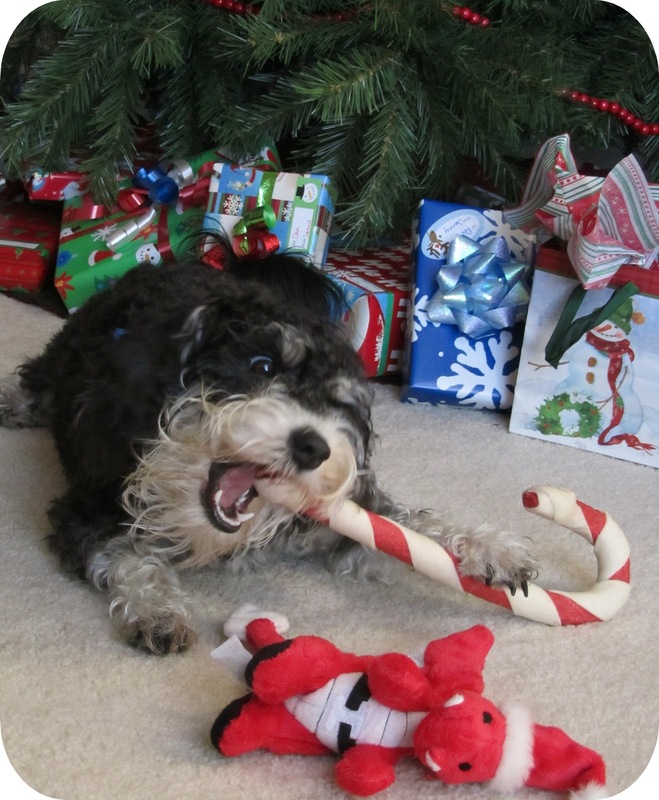 Hope everyone has been having a fabulous Christmastime week! I know I have been having a lot of fun with family coming into town and present wrapping and decorating... not to mention my committee meeting at work that went pretty well. I have actually been so busy with that I spent two whole days with naked nails. Now I finally have them decked out for Christmas! Hope you all have a great Christmas Eve today and a Merry Christmas tomorrow! 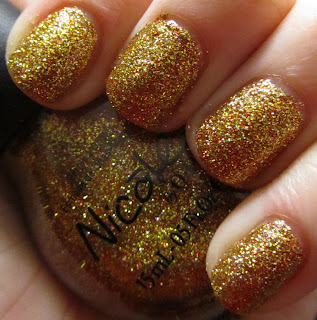 As a heads up, next week I will be giving away the Nicole by OPI Holiday Glitters collection for a "New Year... New Polish!" giveaway - so be sure to come back and enter! 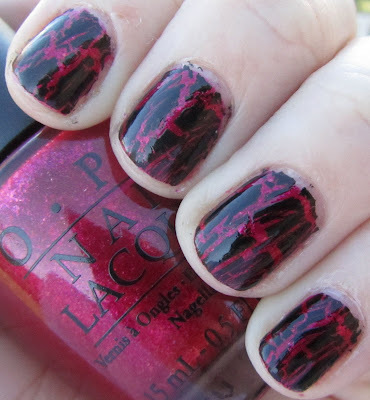 For these nails, I started off with two coats of OPI What's With the Cattitude? as the light sky blue base. 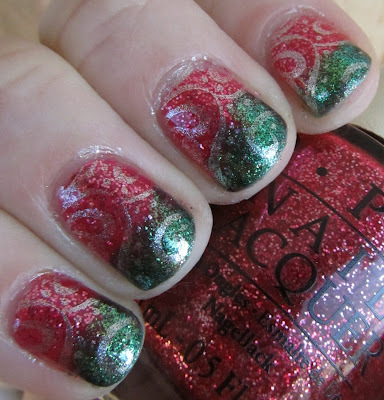 On all but the ring finger, I stamped snowflakes using Konad White and plate m59. I also sponged white onto the tips in a fluffy gradient to give the look of snow. 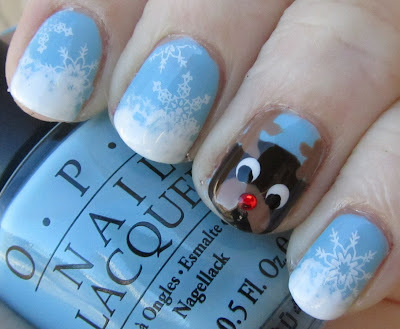 Finally, I painted the reindeer on the ring finger. I started off with OPI Suzi Loves Cowboys for the dark brown, then OPI San Tan-Tonio for the muzzle and antlers. I did the eyes with a dotting tool and added the red rhinestone for his nose. Finally I attempted some mouth-lines with black, but they came out a bit thicker and fuzzier than I had hoped. 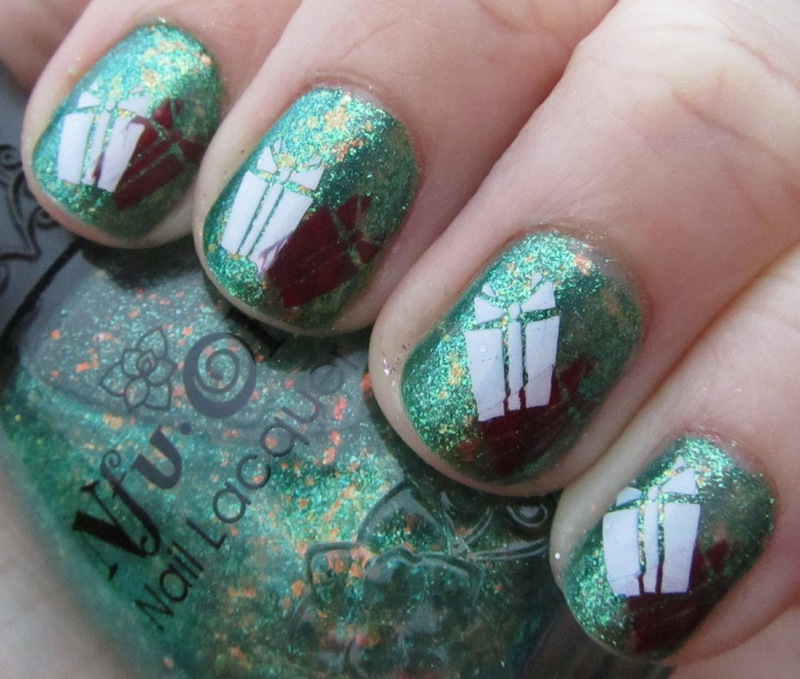 I knew I was going to have to use the gorgeous green Nfu Oh 55 for something Christmas-y, and I thought these cute little present stamps made a perfect match! For this manicure, I started off with two coats of Zoya Ivanka as a shimmery green base. I then layered on two coats of Nfu-Oh 55, and the result was pretty much exact bottle color with jut two coats of the super-sheer Nfu-Oh. I added the cute presents using Konad Special White and Sally Hansen Insta-Dri Rapid Red using the Bundle Monster plate BM205. 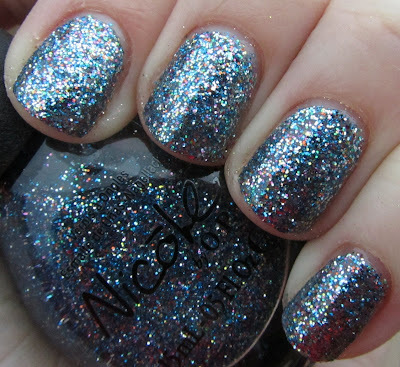 I love Nfu-Oh flakies, they are so amazing. 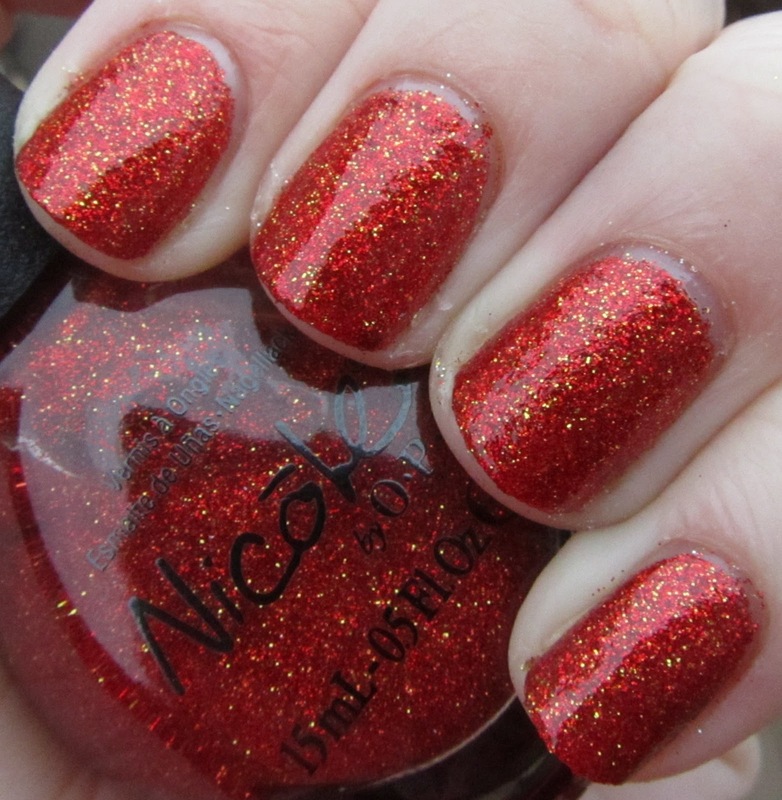 This polish was perfect for the season and looked great. I don't often wear all green, but this is a great time of year - and a great polish! - to do it with! For these nails, I started off with OPI DS Bold, followed by a heavy sponging of the tips with Zoya Ivanka. 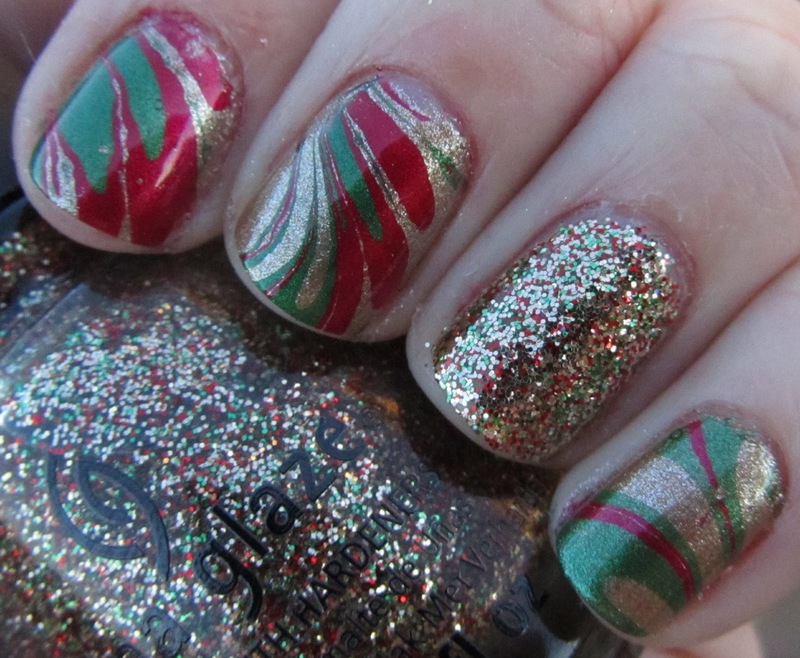 Finally, I topped it off with silver swirls using Zoya Trixie and Konad plate m64. The overall effect was very sparkly and festive. 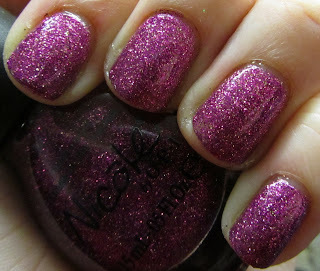 I took this manicure off on Friday... and I haven't painted my nails again yet. :( Still sick, but I will paint my nails today - sometime in between studying for my final and sleeping on the couch. 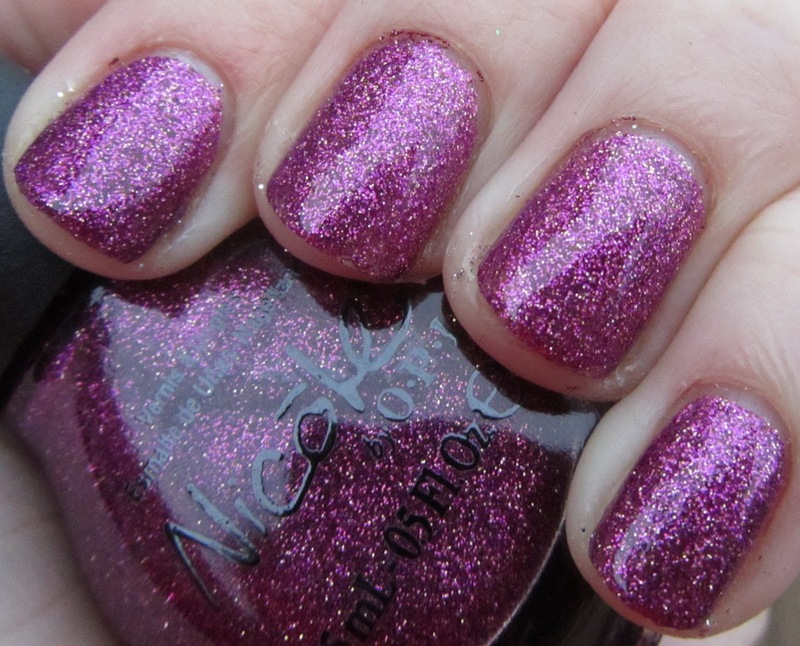 Today I wanted to share with you OPI DS Bold, the second newly released DS shade from OPI. 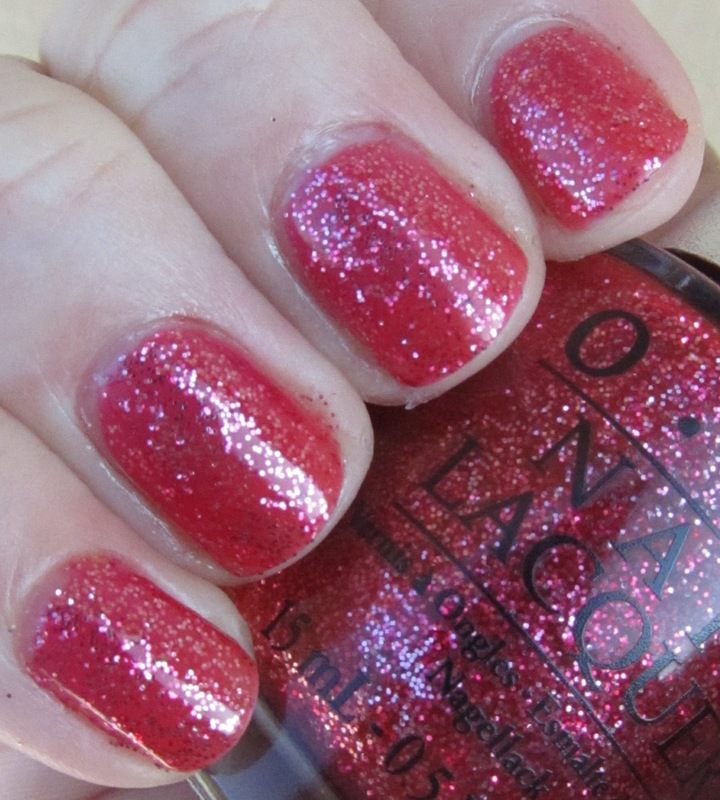 This bright cherry jelly is packed with pink and silver glitter. This is two coats, which went on nice and smooth. 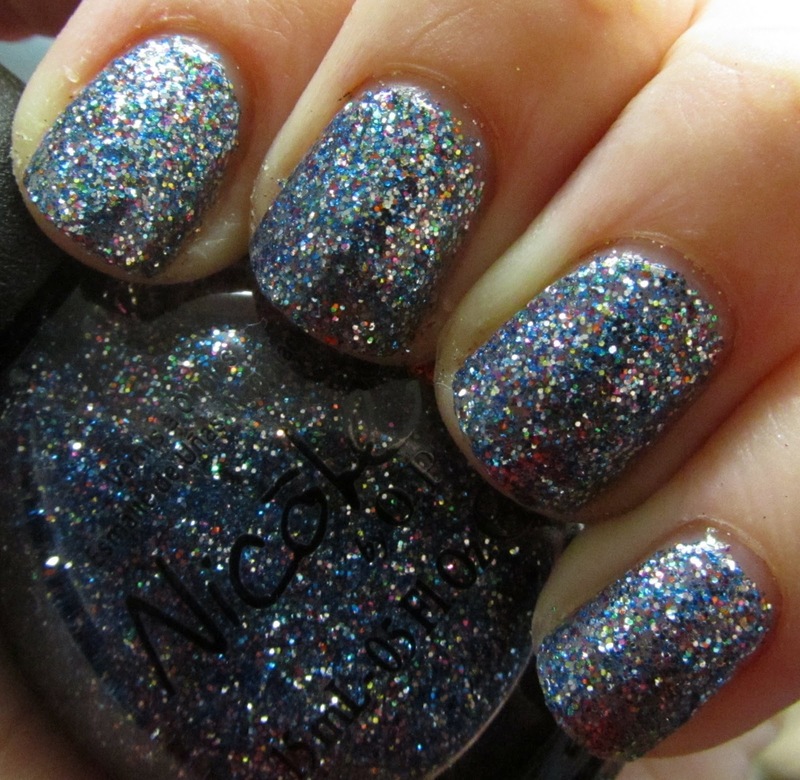 It is a really nice polish. That being said, I really have a hard time justifying this one being labeled as "DS" with the price bump. 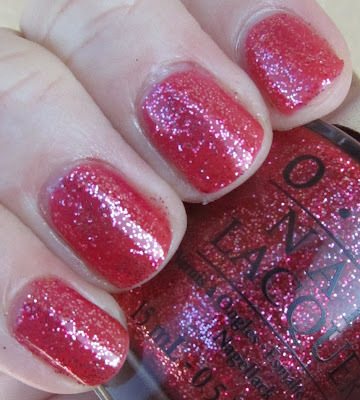 As I am sure many of you guessed or have read, it is a dupe for China Glaze Mrs. Claus from last year's holiday collection. It just doesn't have that extra... something... to justify the DS price tag, in my opinion. Gorgeous? Yes. $4 more expensive gorgeous? Probably not quite. Temptation was a hard enough stretch for me, but this one, while very nice, probably doesn't quite fit in with the DS line. Lets hope that next time we see new DS polishes, they really earn that price increase and the designation "Designer Series." I am curious as to what you all think - do you agree that the new DS releases aren't quite worthy of the title? They are still very pretty though. 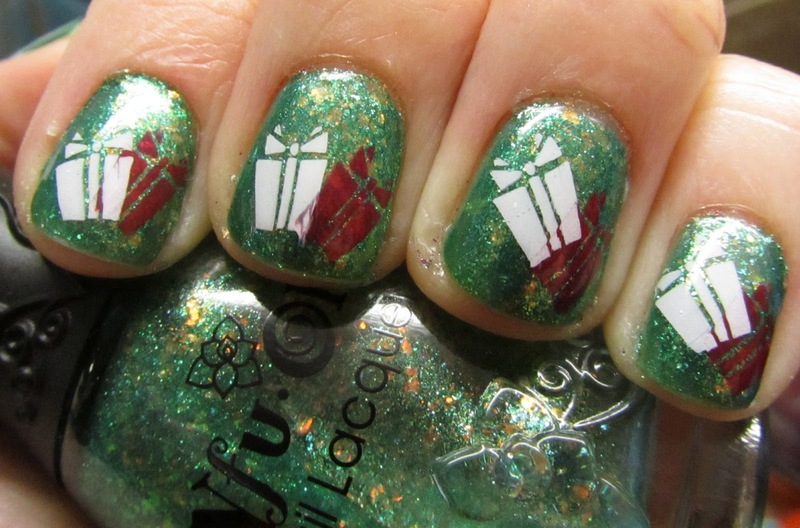 On Wednesday I will post a fun Christmas mani I did with this one! In my quest to grow out these peeling, unhealthy nails, I suffered another setback last week when I had a bad break and had to cut them all back. Good news? I think they are FINALLY starting to get a bit stronger now... but I hated losing the bit of length I had grown back. I guess I would rather them be short and strong for now though. Hopefully I can achieve long and strong soon! After the break I went with something simple. 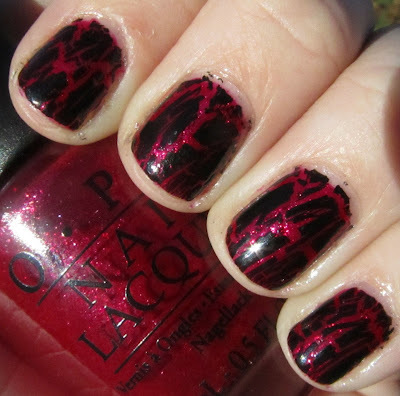 This is Meep Meep Meep from the OPI Muppets collection, topped off with a coat of OPI Black Shatter. I love the contrast between these two colors and the finish on Meep Meep Meep is incredible! This weekend I am finally going to get around to doing some swatching! 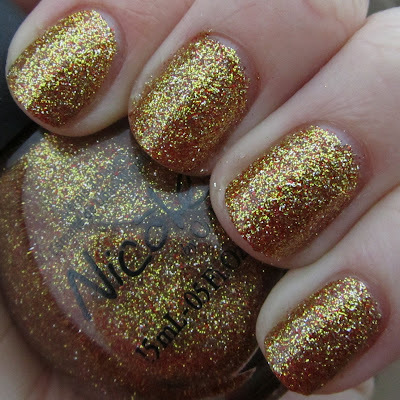 I think my nails should be able to handle it by now, even if the swatches will be a bit short. So expect to see a lot of the more recent collections soon! Also, I will have a (slightly late) holiday giveaway coming up. Hope everyone is having great end of the year! Here is a cute and girly mani I put together using polka dots and bows. Becky's comment was "This is really cute. I should be wearing it, not you." Hm... thanks Becky. :P Surprisingly, this was not done for a K-State event, haha.. although it would have been good! Okay, I will be completely honest, I have no idea what this color has to do with mistletoe. 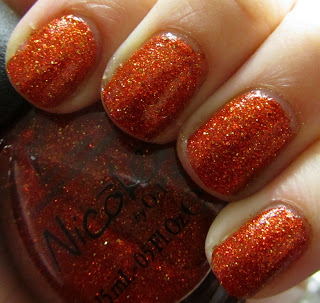 That being said, this is an amazing polish. 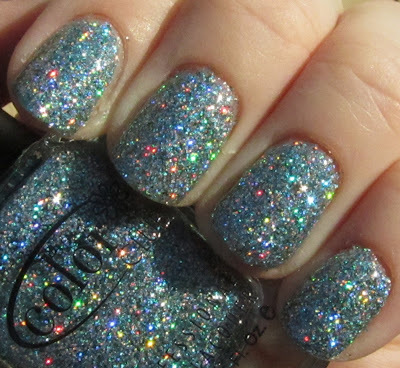 Color Club Beyond The Mistletoe is a dazzling light blue holo glitterbomb. This is three coats, and application was fairly decent, for a chunky glitter. 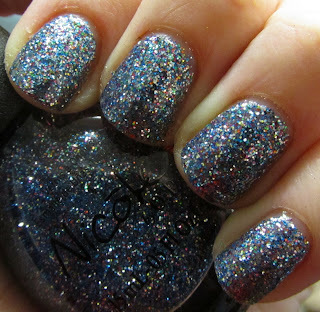 Like most chunky glitters it had some chipping problems, but I am totally willing to put up with it. Look at that holo effect! This polish is just totally and completely stunning. It is the only one I got from this collection (darned budget) and I am glad it is the one I picked. So wintery and fun!